Painted when Wilkie was just nineteen, this ambitious 'portrait' of the annual May fair in Pitlessie Village demonstrated his remarkable talent and the kind of painting in which he was to excel. Its subject and character were radical departures from the established conventions of history painting, although it was equally demanding in its compositional organisation and variety of figures. Wilkie was inspired by examples of seventeenth century Dutch and Flemish paintings and also by Scottish folklore and cultural traditions celebrated in contemporary literature. He met with immediate success in London with this as his showpiece, prompting several prestigious commissions. 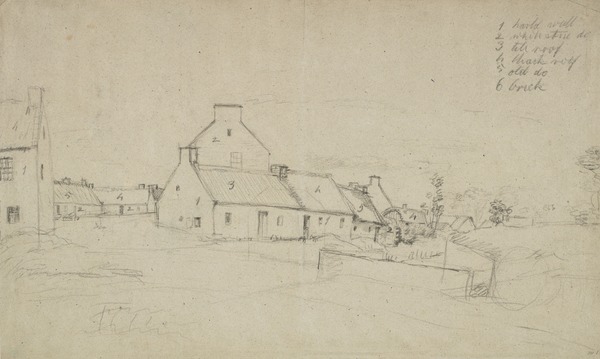 The son of a rural minister in Fife, David Wilkie entered the Trustees Academy (an art school in Edinburgh) when he was only fourteen years old. He moved to London six years later in 1805 where he enjoyed great popular success for his scenes from contemporary life, ranging from The Village Politicians of 1806 to the Chelsea Pensioners Reading the Waterloo Despatch commissioned by the Duke of Wellington and painted between 1816 and 1822. Critical opinion, both then and now, remains divided on the merits of the grander manner that Wilkie developed after trips across Europe in the mid-1820s. However, the range of his work was extraordinary and Wilkie was indisputably one of the most inventive artists of the first half of the nineteenth century. Wilkie’s early masterpiece, Pitlessie Fair, was painted in 1804, shortly after he left the Trustees Academy. 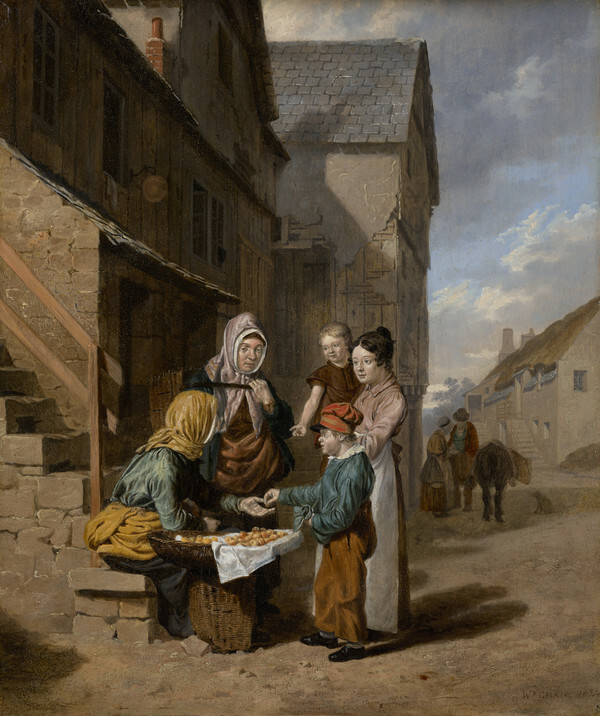 It depicts the annual May fair in a village in Fife that formed part of his father’s parish. The artist’s biographer described the work as ‘the portrait of a village’ and indeed many of the individuals shown here seemed to have been based on drawings and sketches of local inhabitants, some of them captured secretly during services at his father’s church. 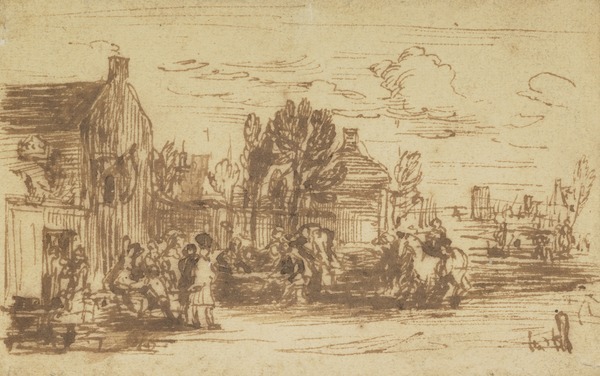 Wilkie was probably inspired by the peasant scenes of Dutch and Flemish artists of the seventeenth century such as Adriaen van Ostade and David Teniers whose work he might have known through engravings or in examples in local collections. Some of the bawdier details such as the woman wiping her child’s bottom or the man relieving himself against a wall could almost have been lifted straight from these artists. There were also precedents for the subject closer to home in the work of Scottish artists, including David Allan and Alexander Carse, and in the wider realm of Scottish song and poetry. In Pitlessie Fair Wilkie pulls these influences together into a work that declares his lively interest in Scottish folklore and traditional life. The composition is simple and deliberately artless as if the artist wants us to wander through the various groups and activities that make up this panorama of rural society. There are touches of humour, such as the soldier who blows his nose rather than his pipes, as well as indications of the harsher realities of country life in the early nineteenth century. Yet while the individual likenesses may verge on caricature, Wilkie’s village portrait is never patronising and is rendered with the sympathy and affection of an insider.